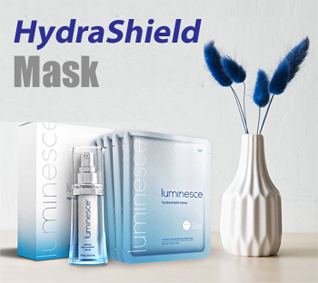 Luminesce™ HydraShield Mask provides high-quality and long-lasting results.Jeunesse made the Luminesce HydraShield Mask with superior biocellulose material rather than paper or hydrogel, because biocellulose masks adhere more snugly to your skin and prevent ingredients from evaporating as quickly. This also helps the HydraShield Mask seal in moisture, giving you up to 24 hours of hydration. The HydraShield Mask helps minimize the effects of daily exposure to environmental aggressors like smoke and smog, and defends against free radicals. Each mask is individually packaged to make it convenient and easy to use. In only 20-25 minutes, this fabulous mask can visibly soothe dehydrated and dull-looking skin. The HydraShield Mask is perfect for busy lifestyles. You can wear it while you do household chores or work from home, but it’s also the perfect product to use when you’re ready for self-care and taking a short break in your day to unwind. It not only makes you feel good about taking “me-time,” but it benefits your skin, too. The best part is that you don’t even have to wash it off! When you’re finished with the mask, simply massage the remaining serum into skin. If you prefer that I personally place your Jeunesse Global skin care order, please call (530) 401-6096, Gwenn Jones, or CONTACT me here. Luminesce Skin Serum by Jeunesse is specially formulated with patent-pending technology to restore luminosity, firmness, and smoothness of the skin. 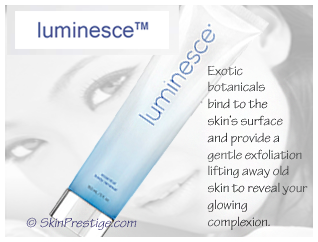 Luminesce™ skin products are proudly Paraben-FREE, USA-made, USA packaged, No Animal testing, and Halal-certified. 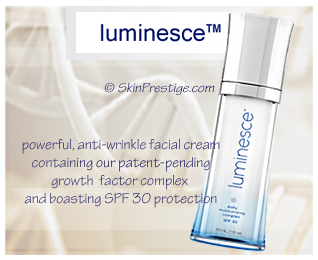 LUMINESCE™ daily moisturizing complex SPF30 is Paraben-Free, Oil-Free, is a powerful, anti-wrinkle facial cream containing our patent-pending growth factor complex and boasting SPF-30 protection against harmful UV radiation. This remarkable moisturizer dramatically improves your complexion by rehydrating, renewing and revitalizing your skin’s appearance. 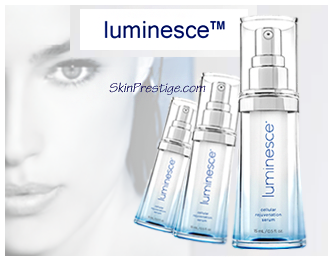 LUMINESCE™ skin care – Ingredients, Info, Pricing here . . .
LUMINESCE™ ultimate lifting masque: I am a regular user of this fantastic masque. This unique formula comes from exotic botanicals found deep in the wild forests of the Andes. These botanicals bind to the skin’s surface and produce an instant lift while distributing moisture fundamental to skin repair. Because this masque gently exfoliates, it casts off old skin to reveal a glowing complexion. 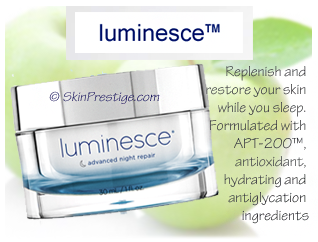 LUMINESCE™ ultimate lifting masque is a crucial component to any serious skincare regimen. Jeunesse™ Luminesce Youth Restoring Cleanser LOVE THIS FACIAL CLEANSER! For all skin types. This unique Luminesce™ brightening gel lightens the appearance of dark spots, discoloration and the look of overall skin tone. Luminesce™ Skin Brightener reduces the appearance of pores for smooth and glowing skin and illuminates and hydrates skin with Silver Ear, the mushroom extract of Tremellas Fuciformis. Our Brightener features our exclusive APT-200, this hydrating formula includes ingredients that reduce the appearance hyperpigmentation, refine the look of pores and brighten skin. See visible improvements with this highly effective gel. INGREDIENTS LUMINESCE SKIN BRIGHTENER: Water, Defined Cell Culture Media 7, Niacinamide, Glycerin, Ascorbyl Glucoside, Butylene Glycol, Mannitol, Carbomer, Pentylene Glycol, Tranexamic Acid, Achillea Millefolium Extract, Tremella Fuciformis (Mushroom) Extract, Cucumis Sativus (Cucumber) Fruit Extract, Citrus Limon (Lemon) Fruit Extract, Nonapeptide-1, Gluconolactone, Tripeptide-9 Citrulline, Glycoproteins, Hydrogenated Castor Oil, Glyceryl Stearate Citrate, Propylene Glycol, Polysorbate 20, Decyl Glucoside, Dextran, Hydroxypropyl Methylcellulose, Xanthan Gum, Propanediol, Cellulose, Sodium Hydroxide, Sodium Citrate, Decylene Glycol, 1,2-Hexanediol, Phenoxyethanol, Titanium Dioxide. 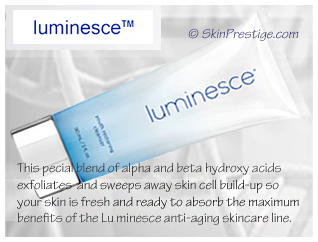 USAGE: Lather face with LUMINESCE™ youth restoring cleanser. Rinse and pat dry. Apply Luminesce cellular rejuvenation serum. Apply one pump of Luminesce flawless skin brightener gel to your fingertips. Dab gel on areas of focus and then massage evenly over entire face in a circular motion until dry. For maximum results, use morning and night. Always use sunscreen. Follow with Luminesce daily moisturizing complex with Broad Spectrum SPF-30 (day) and Luminesce advanced night repair (night). LUMINESCE™ essential body renewal lotion has been specially formulated with optimal ingredients under the expertise of world-renowned dermatologist Dr. Nathan Newman. Your skin will love its antioxidants and human growth factors that revitalize your skin’s appearance, giving you a healthy and nourished look. Indulge in Luminesce from head to toe. This lightweight body lotion delivers a hydrating experience that nourishes and moisturizes the skin, particularly in rough, dry areas. Luminesce™ essential body renewal provides instant and exceptionally long-lasting relief to men and women, revealing a healthy, ultra-radiant complexion, all day, every day. The product is very smooth and the facial skin absorbs it well. It leaves no trace of grease and feels very refreshing. -C.S. I bought the products in the Dominican Republic and I am in love with them. My skin is glowing. Thank you. Happy 4th. -M.D. I like the serum, because i have some dark spot from my acne. Now it’s gone. -D.P. I love the serum. I have sensitive skin and was able to use it. It made my skin feel great and reduced the appearance of the lines on my face especially the ones on my forehead. With my skin being so sensitive if I can use it anyone can. I also love the fact that it is Paraben free. -M.L. 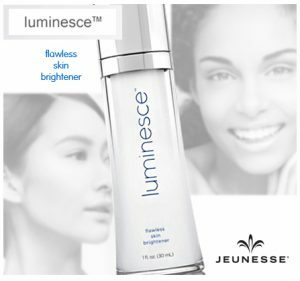 Video for Luminesce Flawless Skin Brightener (above) from Jeunesse™ Global skin care. NOTE: Authentic Jeunesse Global products ARE NOT sold on eBay, Amazon., or other third-party sites. Certified Jeunesse distributors are not permitted to sell on these auction/selling websites. Ensure your Jeunesse product is Authentic. Our Jeunesse distributor ID is: BBFitness.